I'm taking a break from the master bathroom renovation to share a little project I attempted that could only be classified as a total FAIL. If any DIY'r tells you they have never had a disaster project they are lying. This is just one of many I have had, and I thought I would share it with you since I don't want anyone to think that everything always goes smoothly. 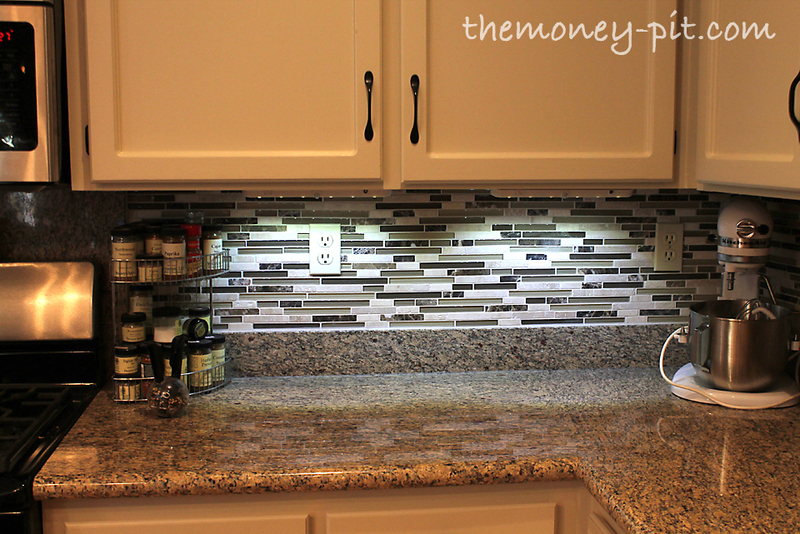 The last project I had lined up for my kitchen makeover was to install undercabinet lighting. 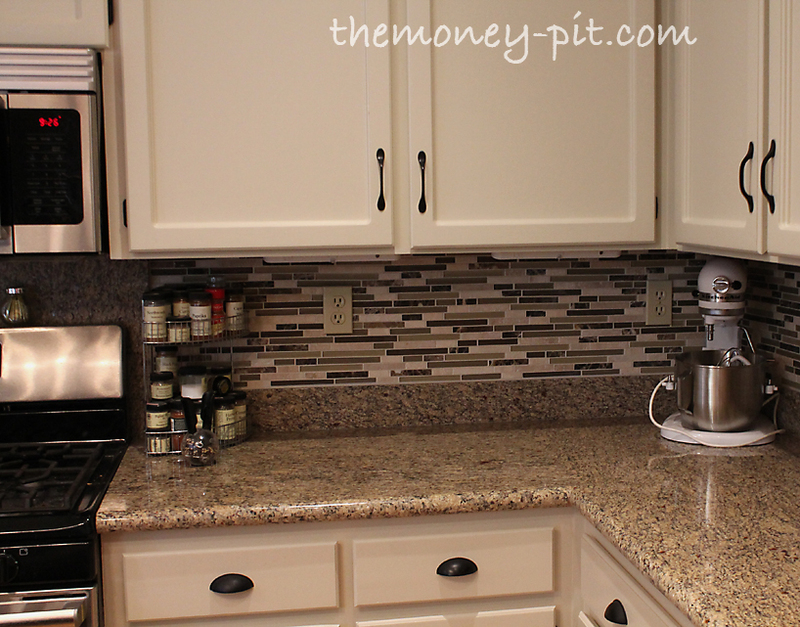 I really wanted to do this because I wanted to accent the pencil tile backsplash I did all that work installing. The other problem was the motion sensor was USELESS. You could jump up and down in front of the cabinets and they wouldn't go off, but if the cat rolled over from the other side of the room, and they would light up out of the blue. I could turn them off and on with the little switch on each unit, but to light up my whole countertop that would require hitting 8-10 little switches. Not exactly practical. Thank goodness Costco has a great return policy because I took them down and took them back. I decided to go with my original plan to use Kelly's (from View Along the Way) LED reel lights. I have ordered all the supplies and will be installing them soon, using the extra outlet above my microwave. Live and learn! Hopefully the next attempt will be much smoother! You are too cute! When my mom built her house, she had the contractor install electrial outlets above the cabinets as well as below because she wanted lights in both places. However, she didn't have HIM install the lighting - she asked ME to do it when I came to visit for a couple of weeks after the house was "finished." It was only out of love for her only daughter that she didn't have the video camera rolling to record the comical scene of a 45 year old woman climbing on the counters cleaning construction dust and debris, stringing lights for her AND arranging her display items. Oh Kim! Yes, things like that do happen! That's something I like about Costco, their return policy! You know? 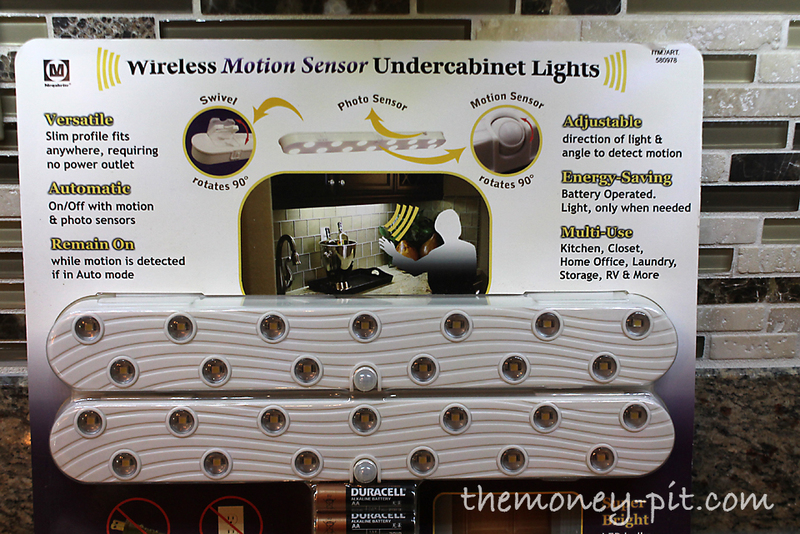 I haven't install my under cabinet lights yet! The wiring is all done, but there's no money for that! Some day! Oh my, it does goes sadly wrong sometimes. Glad you weren't stuck with them and thanks for the warning! I'd love to get some under cabinet lighting for our kitchen, so I'll have to keep in mind NOT to get these. to really оbtaіn ѵаluable dаtа cοncerning my studу and knoωledge.